Yes, I'm continuing this crap into 2016. Why not? It saves me having to do any difficuly crap, like research. I just crack open a bottle and write some rubbish about it. A rounded golden colour with a white head much like Andrew's - worryingly pale. A pleasantly fruity smell, like a wholesale market in the early morning, but without all the noise. Doesn't taste like I expected. Quite a lot of hop bitterness in a twig sort of way. Like chewing birch twigs on a crisp autumn morning. Pretty well made and enjoyable to drink. A winner. It's a Blond, in case you're wondering about the style. "Do you want to try my beer, Dolores?" "If it won't make my mouth taste all horrible." "No, this is a nice one." Dolores takes a couple of sips. "Mm. That isn't bad." 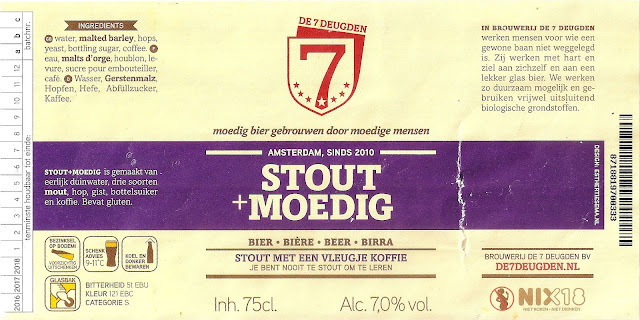 Next, another from De 7 Deugden, an Amsterdam outfit, located in one of the least fashionable parts of the city. Black as a moonless midnight at the bottom of a well. Topped by a cream-coloured cumulus of foam. It certainly looks the part. The aroma is as roasty as an espresso bar's dustbin. In a a good way. That's rather nice. Roast bitterness dances on the tongue while a slug of chocolate slopes by. It's been a good start to the year (it's the 1st January as I write). Two new Dutch beers that are more than drinkable - actually quite pleasurable. And I've already knocked off three blog posts today. What a dilligent Ronald I am.